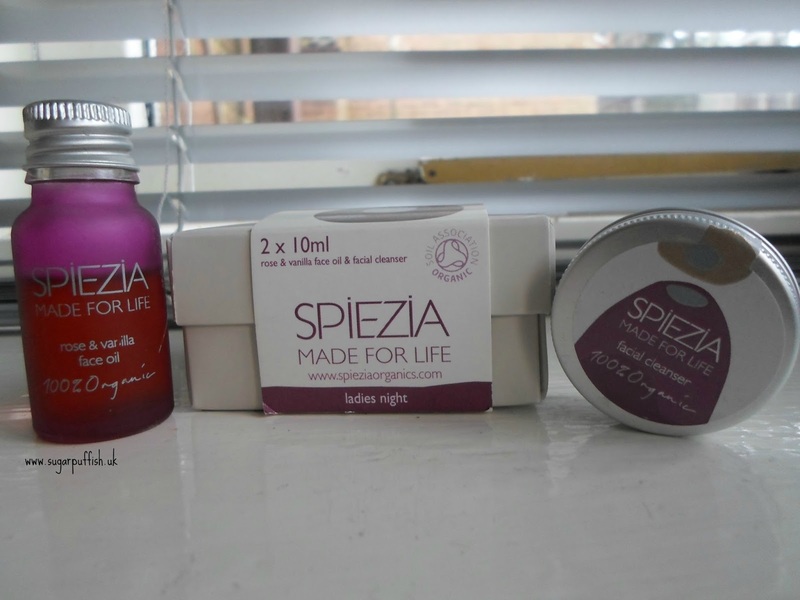 The Spiezia Organics 'Ladies Night' mini gift set was on my Christmas wish list so I was delighted to find it under the tree. The set contains Rose & Vanilla Face Oil (10ml) and Facial Cleanser (10ml). I had previously sampled the face oil at a judging session for the Free From Skincare Awards and was curious about the cleanser. If you have not already noticed Spiezia and Inlight have a common connection, Dr Mariano Spiezia. I have previously reviewed the Inlight Organic cleanser which I adored using and I noticed a similarity with the Spiezia cleanser. Formulation, texture and the distinctive clove scent are very close to one another so it should come as no surprise that I like the Speizia cleanser equally. I would hazard a guess that The Rose & Vanilla face oil will be a love it or loath it product simply based on the scent. I am not a lover of rose but for me vanilla is the dominant scent, it is sugary and sweet. The fragrance extracts have been blended with jojoba and wheat germ oil both of which I find work well on my skin. One thing I have noticed is I dislike using the cleanser and oil together because I feel the scents clash. For me, the clove in the cleanser is dominant and seems to spoil my enjoyment of the vanilla. The mini kit is a great gift but it works well as a sample set and I love the pink bottles. The 10ml sizes provide adequate amount of product to test for a week or two so you can judge how it feels on your skin when applied daily. If you are someone who likes subtle fragrances I would suggest you may not enjoy these products. Have you tried any products from Spiezia? What product(s) would you recommend? I have a little sample of the cleanser to try, I'm so excited! Such a cute set to give someone new to green beauty as well. I have this kit as well. They both worked really well but I don't like the smell of them. I'm a huge vanilla fan so I would love to try the oil, I can see what you mean about how the two would clash though. Seems like a great sample set, very tempted as I've yet to try anything from them!